Simple question: is unsecured wireless an actual, real-world problem? Simple answer: YES. HELL YES. Not a single coffee shop I frequent has any sort of wireless security. While I understand the consequences of that, I know that others don’t. Plenty of poeple take unprotected, public wireless for granted. Some don’t understand the risks and others believe that wireless eavesdropping is beyond the technical reach of just any ol’ person. That’s simply not true. It’s dangerously easy for anyone to do — and today, I’m going to show you how someone can start eavesdropping on an unprotected wireless network in mere minutes. I’m going to show you just how easy it is. And then I’ll talk about what you can do about it. Super important disclaimer text: If you’re not doing this on your own wireless network, get permission first. Otherwise, you may be breaking the law. I will not be held liable for what you do, based on whatever you learn from here. If you don’t agree with that, stop reading. Mac OS X comes with a version of tcpdump, which is a common command-line tool for “dumping” (aka “sniffing”; saving) the packets that zip across a network. 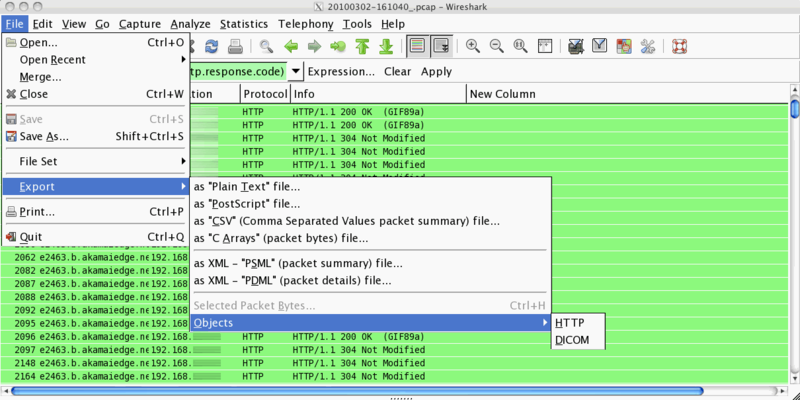 To actually analyze and get interesting information out of the mass of information in a packet dump — download Wireshark. I’m using the Development Release (1.3.4), but Stable should work fine as well. Install that to your Applications folder by dragging it over. and not "(wlan[0:1] & 0xfc) == 0xd4"
-I puts your network card in “monitor mode,” where it listens in on all packets on the network, not just the ones addressed to you. Don’t save miscellaneous packets like wireless beacon packets and pings. There are a lot of them, and they don’t hold any useful data. sudo tcpdump -i en1 -I -n -w ~/Desktop/dump.pcap not ether host 00:26:bb:0b:1e:01 and not host 192.168.1.100 and not "(wlan[0:1] & 0xfc) == 0x40" and not "(wlan[0:1] & 0xfc) == 0x50" and not "(wlan[0:1] & 0xfc) == 0x80" and not "(wlan[0:1] & 0xfc) == 0xa4" and not "(wlan[0:1] & 0xfc) == 0xc4" and not "(wlan[0:1] & 0xfc) == 0xd4"
Alternatively, I’ve wrapped up that command in a script that (should) automatically figure out your IP and MAC addresses, then start a packet dump that saves to your desktop. You can view the script here and download it from here. If the script is working, you’ll notice the dump file appear on the desktop and grow as you capture packets. You are now eavesdropping on other people’s connections on the given wireless network. At any point, you can finish up and close the script by pressing control-c.
Go to File->Open and go open up that .pcap file that you’ve created. The “packet data” panel (the second or third one — bottom one in my example image) allows you to drill down the layers of protocols-within-protocols in every packet. Play around with it! aim.messageblock.message — will only show IM messages over the AIM network. 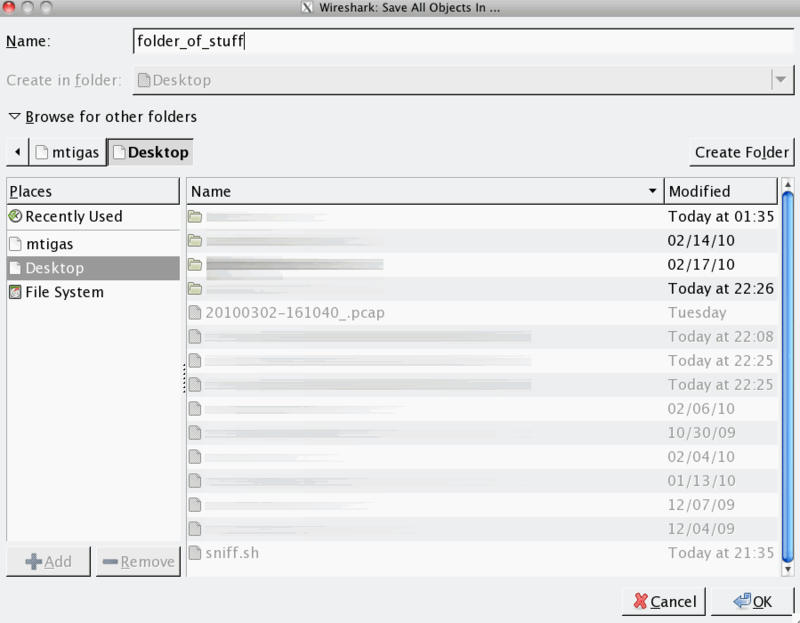 Wireshark can automatically parse out intercepted files and save them to your hard drive. This means you don’t even need to make sense of the raw protocols to get “tangible” results. Go to File->Export->Objects->HTTP. 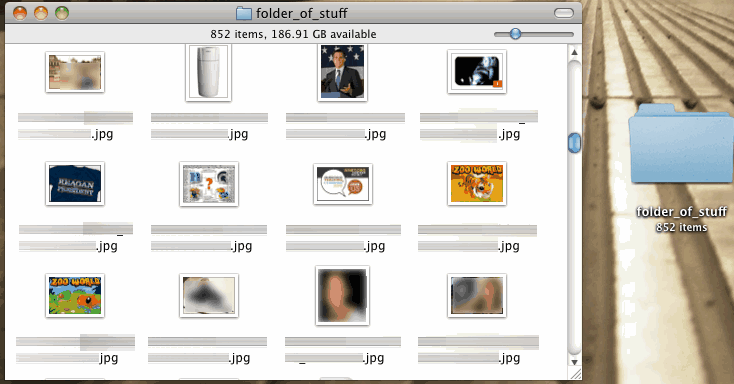 Click on “Save All.” Type in a name for this folder and hit “OK” — ignore the “Some files could not be saved” error. Unsecured public wireless networks are a huge risk to those who don’t understand just how “open” they are. I’ve just shown you how little time and effort an eavesdropping attack takes. In mere minutes of idle time (about 10 in my example dump), anyone has the ability to collect a treasure trove of information on the people using a wireless network around them. Digital eavesdropping and identity theft don’t have to be targeted crimes against specific people. Digital thieves can cast wide nets and hope they drag something valuable in. If your school or company has a VPN, log into it whenever you connect to an open wireless network. (Provided your connection doesn’t need extra authentication like Cisco Clean Access, even non-computer devices like the iPhone support VPN.) Connecting through a VPN encrypts data between you and the VPN — only after your information makes it to your VPN’s internet connection does it become unencrypted (and from there, it goes to the internet normally). Alternatively, if you’re savvy enough to have SSH access to a Web server, you can use it as a secure proxy tunnel in practically the same way. If you understood what I just said, you can probably wing it. Cautiousness is a virtue, online. Be careful and always be prepared for the worst. Think before you log in. Don’t use the same password everywhere. (I used to keep a rotation of about four passwords before switching to all random passwords and 1Password as a password manager.) Don’t take the Internet for granted. 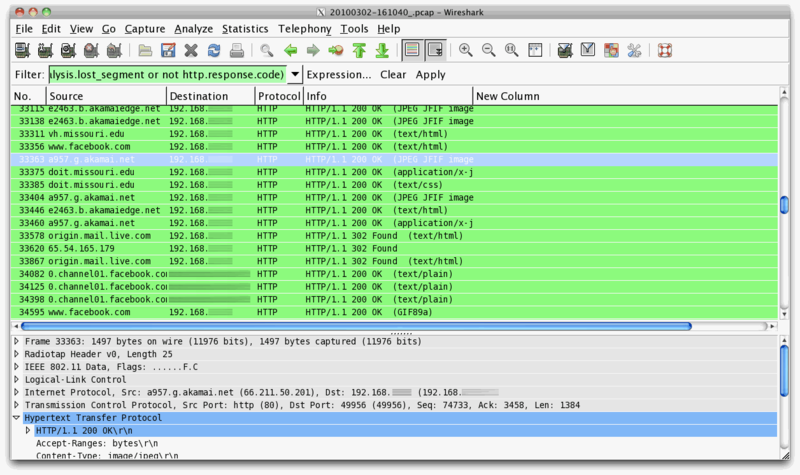 Wireshark does work on all platforms and also performs the sniffing aspects on Windows/Linux — if your drivers allow it. With a little bit of effort, you can figure that out. You can still make do with my Wireshark analysis instructions once you have a packet dump.